Jeep drivers know that what makes their Jeep so strong and durable are the parts. The reason an entire Jeep is quality is because every piece, from the tires on the road to the overhead light, is a solid, well-crafted piece, perfectly designed for its function. At Just for Jeeps, we work directly with Mopar to help people customize their Jeeps for whatever task they want to perform. Whether they want to restore an older Jeep to showroom-like specs, or they want to tailor-make their Jeep for a specific purpose or destination, they want the absolute best parts and components possible. 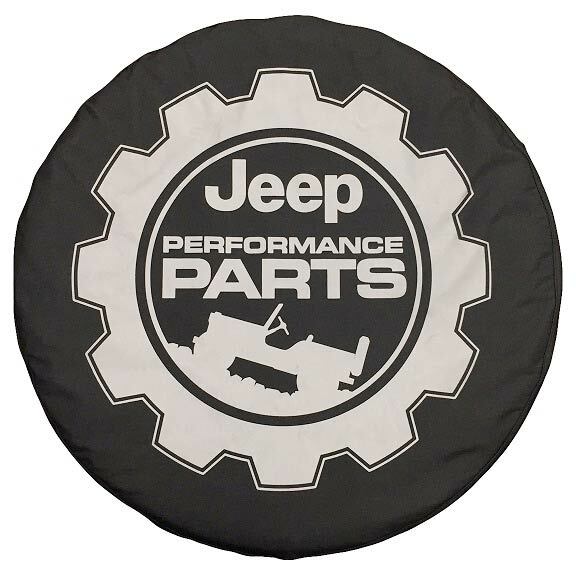 Show your pride for those components with our Performance Parts Tire Cover. It features Mopar's Jeep Performance Parts logo in silver lettering displayed on a black, soft-top material cover. Made to fit the spare of your Wrangler snugly and securely, it's made by Mopar, of course. That means it will mesh perfectly with the look of your Jeep, and will keep your spare protected from all sorts of damage and wear. For more than 80 years Mopar has been making high-quality performance parts for automobiles of all kinds. Mopar's components can be found all over your Jeep, and make it the fine-tuned machine that it is.